. . . Westman Box Office. . . 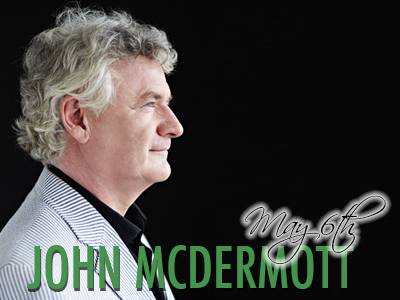 In concert, whether he is sharing the stage with a topnotch group of musical friends or touring the world as part of the famed Three Irish Tenors, John McDermott continues to enchant audiences with his beautiful voice and sensitive renditions. Though time and travel have introduced him to a wealth of new material and experiences, he manages to incorporate that diversity into his performances, while retaining the beguiling sense of humour that endeared him to audiences from the beginning. This tour features songs from his latest release, Traditionally Yours, as well as a variety of favourites from his vast recording catalogue. A delectable evening of story and song, delivered with charm and grace by the consummate craftsman himself, John McDermott.